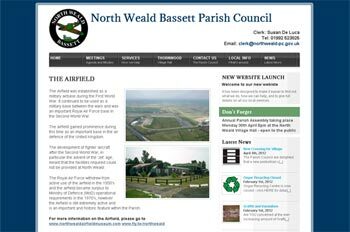 We were delighted to be commissioned by North Weald Bassett Parish Council to develop their website into something that would help the PC engage with the community and be a conduit for information flow in both directions. Having provided the council Internet services for a number of years prior, the council knew Toucan and were impressed with the level of support they had received. The website had a tight budget and after a review of available options, it was decided to produce it on a WordPress platform giving affordability and flexibility. After the final training the council are editing the whole site themselves including the calendars, images, text and pages. If you are looking for a reliable provider of business email facilities with a human interface, please have a chat with Simon @ Toucan Internet LLP, details below. To find out more about how Toucan Internet LLP can improve your online success with an affordable web developemnt that will give a return on investment, please feel free to contact Simon at the contact points below. Copyright Toucan Internet LLP 2012©. All rights reserved. As providers of email facilities to business, Toucan Internet LLP is called upon to offer additional support for the many mobile devices that hang on the end of our services. Most of these have their own little foibles that, if you’re unaware of, can cost hours of lost time, raise your blood pressure to dangerous levels and leave you wondering why you ever upgraded in the first place. Don’t worry you’re not alone. Some clients have issues connecting the iPhone to POP3 accounts, not because of the product itself, but rather the lack of configuration advice available to users. Having helped clients recently, this basic information may well be helpful to many. If you have another device such as a main PC that is also collecting your email, then there can be clashes as the POP3 protocol that handles your mail can only service one device at one time, therefore if one is connected and the other one polls the mail box it will return an error as it cannot get access. Here we see the iPhone log in at 12:54:35 from IP address 212.183.140.122 and before that mail session has closed the office PC log has attempted a connection to the same account from 83.104.167.229. The office pc would report a connection error. To avoid this being a continual issue one solution would be to only have the office PC collecting when you are there. There are countless other ways email accounts can be configured that we’ll not debate them all here, but rather flag up this iPhone/Mobile device and POP3 issue. Particularly with the iPhone and the above configuration with an office PC on the same account it is important to set the iPhone push facility to “off”. From our experience if this is set to “on” the iPhone doesn’t close the session after polling the POP3 account therefore locking the mail box from access by other devices, such as the office PC. Specific to Toucan Internet LLP POP3 accounts in the advanced settings set “SSL” to off. The SMTP authentication should be set to “password”. Thank you for your help and assistance with the iPhone4 queries, you have achieved in 5 minutes what Vodafone have taken over 2 hours to not resolve! I have discussed with them just now about Outlook needing to be closed to get emails on the iPhone and they have advised altering the Outlook settings to ‘keep the mail on the server’ which I have done and it appears to be working OK but goodness knows what else it will put out of sync! Copyright Toucan Internet LLP 2011©. All rights reserved. Zoom Answer Call is celebrating its first successful decade in business, over eight years as a client of Toucan Internet. In 2002 Chella Hayes, CEO of Zoom decided to rebrand the company’s logo, website and stationery and chose Toucan Internet to assist in this project. The resulting distinctive branding is still in use today, epitomising the quality of business call handling from Zoom. We wish Zoom Answer Call a successful second decade. At Toucan Internet we’re looking for more businesses that want exceptionally high quality internet services and unparalleled support. Please call us for a chat. Copyright Toucan Internet LLP 2009©. All rights reserved. 9-12 Bell Yard is a leading criminal barristers’ chambers in the City and they chose Toucan Internet as their web designers earlier this year. Apart from the main web projects, Toucan’s creative design team has been engaged in producing a number of items in various media for Chambers, including email campaigns, digital Christmas cards and a hand drawn website. The annual Chambers’ party aboard HMS Belfast was a real success and Toucan designed and produced the impressive corporate folders together with the event invitations for the night. These designs were based upon a newly evolved logo icon taken from designs that had been created as part of the development work for the Chambers’ new website. 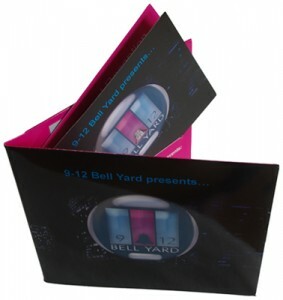 The folder and modified logo are designed to give great value in that they can be used on more than just one occasion. The generic chambers folder will double as a CD presentation folder for distribution of material such as course notes, whilst the modified dynamic glass effect logo will feature in the forthcoming website. Simon Thomas, Partner of Toucan Internet said “This is a great example of how a brand identity can be effectively used across different media. Toucan’s strength is that we have all the resources required including creative designers, Flash developers, programmers, systems people and the team approach to make these projects a success for our clients”. For more information or details on how Toucan could enhance your marketing and promotional material please call or email. Having been immersed in the commercial side of the Internet since 1995 we at Toucan can talk Klingon where required but prefer helping you develop your online business in plain English.